The pie chart below shows the native languages spoken by students at Bakersfield Senior College in two separate years. 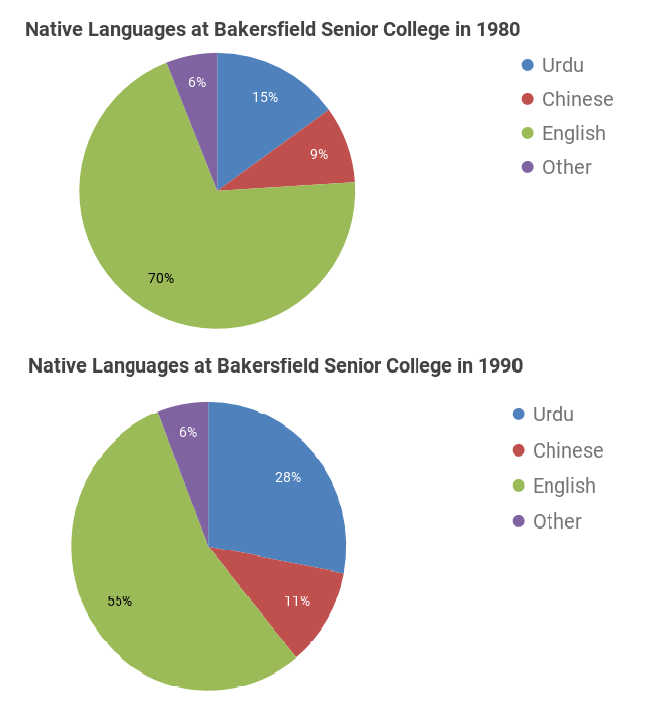 The two charts depict the proportion of Bakersfield Senior College students who spoke different native languages in 1980 and 1990. On the whole, the pie graphs show that at Bakerfield Senior College, the percentage of students who spoke English decreased while those who spoke Urdu and Chinese rose. In 1980, the largest group of students – seventy percent – had English as their mother tongue. Urdu speakers comprised the next major group at 15% while Chinese and other languages were spoken by 9% and 6% of the student body. By 1990, the sizes of the different language groups had changed. Where native speakers of English still made up the dominate group, the percentage of them shrank by 15%. Meanwhile, the number of Urdu speakers almost doubled to 28%, and Chinese speakers had increased to 11% of the total. The proportion of speakers of other languages remained unchanged in both years. It uses “proportion” over “percentage,” which was used in the question. The key highlight is that English decreased as the lingua franca for many students between the two years while other languages, specifically Urdu and Chinese increased. Describe the first pie chart, so that trends or differences can be highlighted in the second. Active and Passive sentence structure is used here to give variation to the writing. The “student body” means the body of students or all students collectively. Introduce the main difference / trend in the first sentence. Give a concession to show the change in English native speakers. The next sentence shows the next two major shifts in languages spoken, while the last sentence shows a status quo for the other languages used. Since we’re giving a change before 1990, it’s important to use past perfect as we don’t know when that change exactly occurred. The two chart depicted the proportion of Bakersfield Senior College student spoke different native languages in 1980 and 1990. On the whole, pie graph show that at Bakerfield Senior College, percentage of students who spoke English decreasing while those who speak Urdu and Chinese rose. In 1980, the largest group of student – seventy percent – had English as their mother tongue. Urdu speakers comprising the next major group 15% while chinese and other languages were spoked by 9% and 6% of the student bodies. By 1990, the sizes of a different language groups had changed. Where native speaker of English still made up the dominate groups, the percentage of them shrinked by 15%. Meanwhile, the number of Urdu speaker almost doubling to 28%, and Chinese speaker had increased to 11% of the total. The proportion of speakers of other languages remained unchanged in both year. Consider the 1980 pie chart. How is the percentage of each of the language groups different? What is the largest/smallest segment? Now look at the 1990 chart. Where are the changes and similarities? How does the proportion of English native speakers change over the decade? Which languages became more widely spoken during that time?